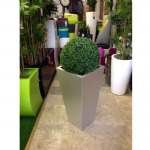 A huge range of galvanised steel pots and planters, cube pots, square pots, round planters and garden troughs. A beautiful material that will dull down in time to achieve an industrial, minimal and contemporary look. Galvanised steel has gone through a protective chemical process that prolongs the life of the steel to avoid corrosion. 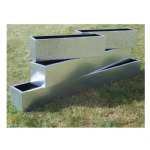 A very popular product with garden designers throughout the UK.